The lecture will be devoted to the topic of how the biological world supplies itself with energy to make biology work, and what medical consequences ensue when the energy supply chain in our bodies is damaged or defective. We derive our energy from sunlight, which, via photosynthesis in green plants, provides high energy components in the foods that we ingest. We harvest that energy, effectively by _burningî (oxidising) the high energy components, releasing cellular energy in a controlled way to generate the fuel of life, in the form of the molecule known as adenosine triphosphate (or ATP for short). The key steps in this process take place in the mitochondria inside the cells that make up our tissues. They serve as biological “power stationsî that contain millions of tiny molecular turbines, the ATP synthase, that rotate rather like man-made turbines churning out the cellular fuel in massive quantities, which is then delivered to all parts of our bodies to provide the energy to make them function. Each of us makes and expends about 60 kg of this fuel every day of our lives. Defects in the fuel supply process are increasingly being recognised as important components of complex human diseases such as cancer, neurodegeneration and neuromuscular diseases, and they may also be part of the process of ageing. The ATP synthases found in mitochondria eubacteria and chloroplasts have many common features. Their overall architectures are similar, and they all consist of two rotary motors linked by a stator and a flexible rotor. When rotation of the membrane-bound rotor is driven by proton motive force, the direction of rotation ensures that ATP is made from ADP and phosphate in the globular catalytic domain. When ATP serves as the source of energy and is hydrolysed in the catalytic domain, the rotor turns in the opposite sense and protons are pumped outwards through the membrane domain, and away from the catalytic domain. Although, the ATP synthases from mitochondria, eubacteria and chloroplasts have many common features in their catalytic mechanisms, they differ fundamentally in the energy cost that is paid to make each ATP molecule, and the most efficient ATP synthase is found in the mitochondria of multicellular animals. The ATP synthases in unicellular organisms, and chloroplasts, pay various higher costs that seem to reflect the supply of available energy in the biological niches that they inhabit. 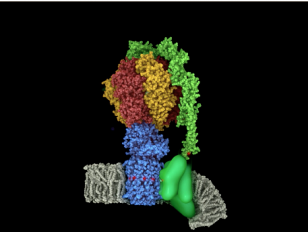 The ATP synthases also differ significantly in the way they are regulated. Eubacteria have evolved a range of mechanisms of regulation, and the chloroplast enzyme is rendered inactive by a redox mechanism in the hours of darkness. Mitochondria contain an inhibitor protein, IF1, which inhibits ATP hydrolysis but not ATP synthesis. Its in vitro mechanism has been studied in great detail, but its in vivo role is mysterious, and suppression of expression of the protein appears not to influence respiration.